First off, be sure to enter the Get Clean Sweepstakes! 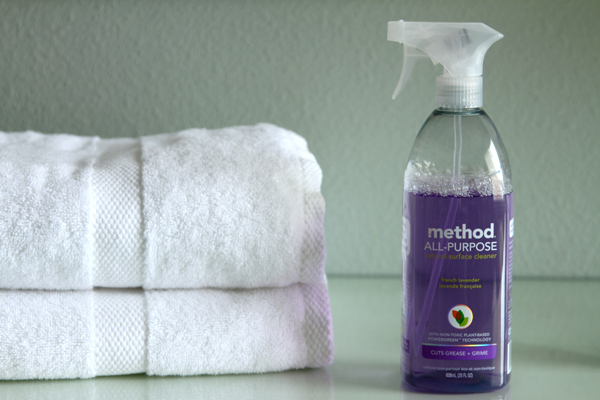 Over the weekend I worked on Spring Cleaning our bathroom with the brand new nice smelling French Lavender All-Purpose spray that Method sent over and here are a few of my tips when it comes to cleaning the bathroom. 2. Sort through your cosmetic and beauty products and make sure they are being used. Why have things that you've had in your bathroom closet for years if you don't use them or plan on using them? Save the space and discard that old eyeshadow color or shampoo you don't like. If you wear makeup, also make sure to clean your makeup brushes often. 3. Start being an educated consumer: This tip may not be for everyone but is a personal preference. A few years ago I sorted through all of our bathroom and cosmetic products and chucked everything above a 5 on the EWG Cosmetic Safety Database and I do my best to not purchase anything above that number. From what I've learned, what you put on your body gets so quickly absorbed into our systems and just like the food we consume, I want to make sure we are not putting unnecessary harmful toxins in our bodies. p.s. If any of you have found a great 'aluminum-free' deodorant that works, hit up the comments -- I've tried 3 and I'm still searching. 4. Clean your bathroom once a week : When you keep on top of the weekly cleaning it really isn't that big of a deal to clean the bathroom. It is my least favorite chore so I often make it fun by turning on upbeat music and just going for it. 5. Have supplies handy: Make sure you have certain bathroom supplies stocked up and close by. The worst is running out of t.p. when it is most needed or eek... has this ever happened to you when you were at someone else's home? Have backup supplies accessible for guests as well. What about you, what types of things do you do when cleaning the bathroom? *This post is sponsored by Martha Stewart and Method, but these opinions and tips are how I really roll. Photos by Rachel Jones – Black Eiffel. I turn on one of the music channels *loudly* when i clean the bathroom. I bet our neighbors think we are hvaing a rave or something. I used to like cleaning, until I grew up! I don't love it so much now that I have to do it all the time (I'm a little OCD like Monica too!) I have cut back (ha!) and am trying to be less obsessive about the cleaning. Anyway, I bought this cleaner recently and it smells soooooo good!! Even my husband commented about how good it smells! The funny thing is that I was using Martha Stewart's all-purpose spray cleaner that is odorless before this and wonder which one I'll stick to! I feel like going home and cleaning my bathroom now! i use and love natures gate winter clean aluminum free deodorant. good luck with your search for one, it took me years. I totally cleaned our bathroom this weekend as well. I'm also obsessed with the cosmetics database. It greatly influences all my purchases. The next thing I need to do is get matching towels, but my boyfriend is a bit of a mess, so I'm thinking not white. Perhaps a lovely grey? I hate cleaning the bathroom but you're right. Doing it every week makes it feel like it's not that big of a deal. I always make sure to dust/wipe with a rag all of the baseboards and molding around the doors. I hate the look of dust and dirt on white baseboards. Oh! And I also make sure to thoroughly clean the door handles on both sides. I love that hip & humble mug! Where is it from? try 'tom's of maine'.. I absolutely love them.. there is also a canadian company, called rocky mountain soap company and they have an awesome one, too..
Chapstick Fanatic -- What channel do you use? Malin and Goetz Eucalyptus deodorant. The scent disappears after a few minutes so you don't smell like eucalyptus all day. Lilly -- I haven't tried the Martha Stewart Cleaner, good to know it works well, although I still love that lavender. Thanks so much for the tip. Mrs. Peacock - I will have to try Nature's Gate, haven't tried that yet. Thank you! Kristie : I totally agree with you, I hate the dust on moldings and doors too! Great tip. Nic Riess - I love "Tom's of Maine" products, although I haven't tried their deodorant yet. Thanks for the suggestion. Nicholas & Erin : I haven't tried Malin and Goetz deodorant, the packaging looks very cool. I'm adding it to my list, thank you! My skin doesn't agree with Tom's or Nature's Gate, but I've heard from others that it works well. I use Liquid Rock in Peaceful Patchouli - it smells and works like a dream! I use the Tom's of Maine in the lavender scent. I hadn't had a chance to really test it out until today. It's so nice and warm here that I couldn't resist going for a walk. And I still smell fresh. Yay! I ADORE cleaning my bathroom...no other room in my home looks and feels quite as clean as my bathroom post-scrub. I would like for my house to always smell like lavender. the natural deodorant i recommend is by Earth Science, it uses lichen plant, no aluminum. i've also been a fan of Kiss My Face's liquid rock deodorant. nothing works 100% but these are good in the "won't kill you" category. Have you found a sunscreen that is low on the database? I was committed to the Dr. Hauschka sunscreens and then the EU changed the requirements/standards and now the EU sunscreens are no longer made :-( Any suggestions? my favorite line - Discard any shabby towels and invest in matching ones. Crystal body deodorant works awesome. No fragrance, but no body odor either! i also use the JASON brand deodorant and i really like it. it was hard to lose the antiperspirant part of regular deodorants but i realize now that it's not healthy to block your sweat pores. now i just want to smell good. the malin + goetz deodorant is on my list, but it's expensive! I liked this write up. I love a good clean bathroom and white towels are a must! I recommend Salubritas natural deoderant. It's great and completely aluminum free and you can read the small list of natural ingredients right on it. How do you keep your white washcloths white? Mine are dingy from overnight guests cleaning off their make-up. Rachel - this post is so timely! I just discovered that website a couple of weeks ago and have been going through everything in my cabinets, too. On top of that, the little one had an allergic reaction to something last week (still trying to figure out what to) so now I am even more gung ho about getting rid of unnecessary toxins. When I decided to give up deodorant with aluminum, I was never able to find a natural alternative that worked for me. Ever. Then I tried what our great-great grandparents used to do--baking soda. Totally weird to get used to; works better than anything I have ever tried (including Secret brand antiperspirant). Ever. I just keep a small jar of baking soda in the bathroom. Some books say to make a paste, but that was too much for me. I use two fingers to dab some water in my armpit, then dip my damp fingers in the jar and dab on the baking soda. The only drawback is that it can leave some white on your clothes if you sweat heavily. But I never smell anymore!! For six years now. On a different note, I love the idea of white towels, but I have four boys between the ages of 11 and 1. Is it realistic to think I could have white towels that looked nice without changing them every day? I'd appreciate advice from anyone who's done white towels and small children! The Body Shop's is exactly what you want! It's the only aluminum free deodorant I have ever come across in my ten years in the cosmetic industry that stops you from sweating, not just smelling. Plus, it's only five bucks! It can't be beat. @Amy of Progressive Pioneer -- Thanks for the Pit PUtty tip, I will have to try it. @Kohlee Kennedy -- I've never heard of Liquid Rock, cool another one to try! Thanks. @Nicole -- Cool! Glad to hear Tom's of Main works well. @Rach -- Yes, you should really try the Method line, it is fantastic! 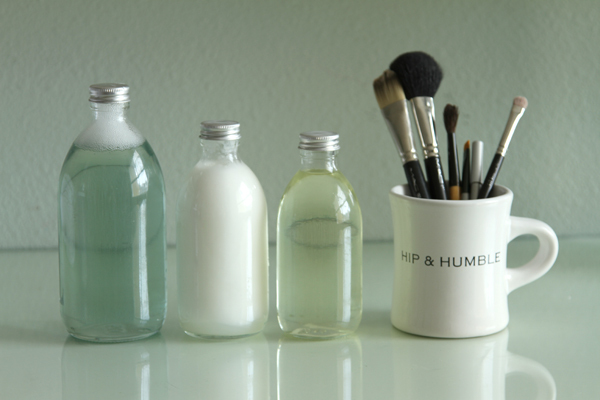 jess@theanatomyofstyle -- I totally agree, there is something that feels so good about a clean bathroom! @TheCookingSociety -- yes the lavender is very soothing. @sue -- Thank you! I am actually trying the Earth Science one right now! @kehs11 - Cool -- I will have to try Jason as for sunscreen I've heard great things about the Badger line.. although I am testing that as well. @Kara -- thank you.. I like how it really looks like a crystal! @Brittany -- another nod to Jason, good to hear, and yes the malin + goetz is darn xpensive. @Missy -- Thanks! I appreciate it, and they are in Park City, cool! @Mel -- I just throw my towels in the wash and sometimes throw a little bleach in and they are as good as new. @Eva -- sorry to hear about little I. I hope that her allergic reaction goes away! It is a really great site, I'm a fan, although it is tricky to find products that I really, really like. @tiff -- Thank you so much! I think that is a clever and great idea that I will have to try. As for the white towels, I have a 4 year old girl and 7 month old and we haven't had a problem. I just throw them in the wash probably once a week, sometimes with a little bleach and they are all good. The only thing that gets a little messy sometimes is my handtowels that my daughter likes to grime up -- so I have quite a few of those on hand, but yet again, once a week in the wash! @Stephanie -- Thank you! I hope to maybe get my hands on those, although they are German. @Anonymous and @Jillian -- Thanks! The Body Shop one must be a good one, it has been recommended a lot, I appreciate it! This is such a great post and good reminder that I need to switch out my deodorant. I'm wondering where you got those great glass bottles. I love the streamline look! deoderant: i use old spice, swagger. it smells fantastic & manly, works like a charm and is aluminum free! Thanks for all your fabulous posts - I love Black Eiffel! Try Weleda Wild Rose deodorant. It is spray on and I promise you will love it. Sometimes I have to re-apply during the day but the scent is romantic and it lasts just fine through a hard workout. Malin & Goetz eucalyptus deodorant is the only one that works, and I've tried ALOT. I have been using Tom's of Maine for years with success. It doesn't exactly keep you dry all the time, of course, but it keeps your stink-free!! Good luck! Lavanila Labs- "The Healthy Deodorant" in Vanilla Lavender is awesome & no alum or parabens, says 100% all natural. Only thing that works for me & has a nice light smell. I have tried so many aluminum free deodorant brands and finally came across Naturally Fresh. Works like a charm, the scent is soft and there are several rather normal choices (Ocean Breeze, Lavender, Unscented, etc). It rarely leaves marks, is totally clear on the skin, and works all day. The one down side is that they recently changed the packaging from opaque plastic to grey/silver plastic which isn't quite as nice (small down side). I've used the Ocean Breeze for about two years, and love the roll-on!